Serial leaker IceUniverse recently shared some new images of the upcoming Samsung Galaxy A8s giving us a clear look at the device. The image he shared earlier today of the upcoming Galaxy A8s revealed the gray color variant of the device. However, it looks like the upcoming Galaxy A8s will be available a verity of color options with gradient finish. 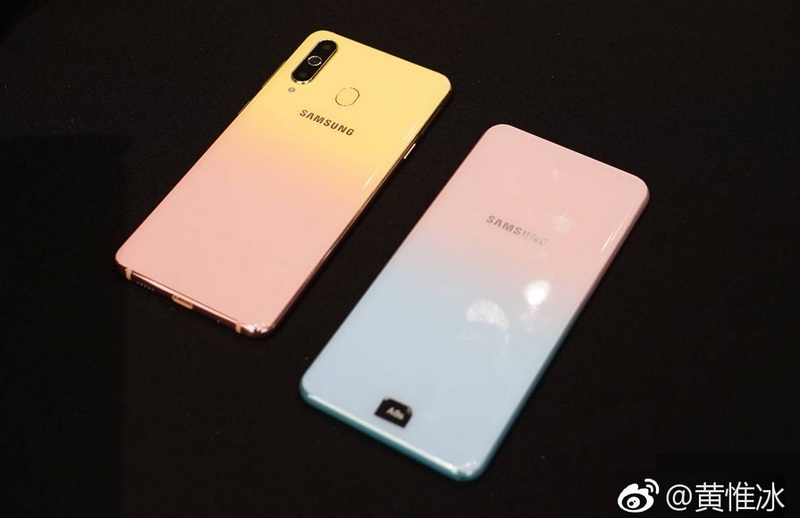 According to a reliable source on the Chinese microblogging site Weibo, Samsung Chinese President Quan Guixian in an exclusive interview with the World Expo today said that Samsung will launch the Galaxy A8s in two more color option especially for females on Valentines Day, February 14 in China. The two new color option of the upcoming Galaxy A8s will include a Pink Gold Gradient and Blue Gold Gradient color options. @MMDDJ_ on Twitter called the two new exclusive female color variant as Galaxy A8s FE and we are not sure that what this FE actually stands for, maybe a Female Edition?. Surprisingly, the Blue Gold Gradient color variant option of the Galaxy A8s doesn’t appear to have rear cameras. As you can see on the images above there is no camera on the back of the blue variant. Now we wonder, where Samsung has placed the rear camera on the blue color variant. We also didn’t find the fingerprint sensor at the back of the device. However, the regular Galaxy A8s variants will have a punch hole camera at the front. What do you think about these two devices? do let me know in the comments section down below.